Choosing the right light fixture for the rooms in your home might seem like a daunting task, but when you explore the benefits of various types of lighting solutions, determining which ones will best meet your needs becomes easier. If you are looking for a type of light fixture that provides ample illumination and design, sconce lights are an affordable option for any room. In today’s post, we’ll take a closer look at this lighting option as well as the benefits of incorporating it into your lighting design. The lighting experts at Brighter Homes Lighting in Eugene are here to help make your shopping experience one that is enjoyable and educational. If you’d like to learn more about this beautiful lighting option for your home, contact our team at 541-343-2556 or swing by our impressive showroom today! You may have heard the term “wall sconce” before, but if you have never seen this type of light fixture, you may not be familiar with the simplicity and elegance that it can lend to a room. 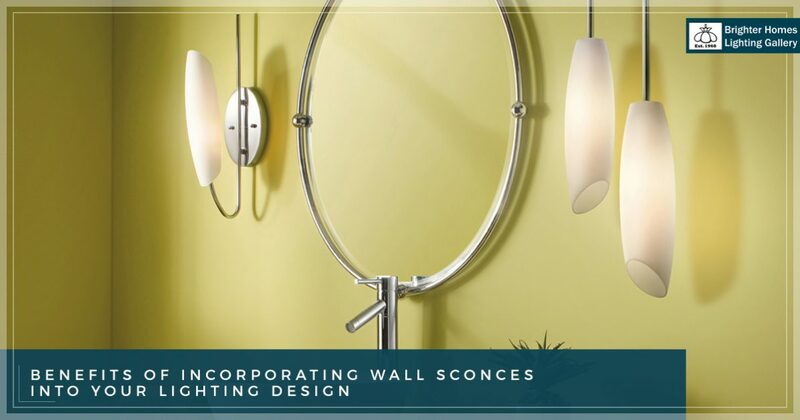 Sconces are a type of wall light fixture that uses only the wall for support; there is no base to support the light. The illumination provided by this type of fixture is usually directed upward, but may also point downward to illuminate paths or stairs. There are many benefits to this type of lighting, including their low profile, decorative fixtures, and energy efficiency. Whether you are remodeling or choosing fixtures for a new home, there are several advantages of choosing sconce lights over other lighting solutions. Because they feature wall-mounted fixtures, sconces tend to be one of the least invasive types of lighting in terms of how much space they take up in a room. 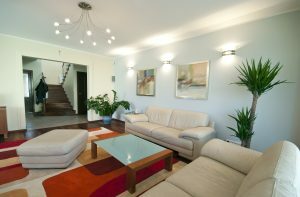 Floor lamps are wonderful for providing ample ambient and task lighting, but because the base sits on the floor, they must be taken into account when arranging furniture. Likewise, table lamps may cause glare on televisions or take up more space than you’d prefer on your end tables. When installed at an ideal height of 66 to 72 inches off the floor, wall lighting provides the illumination you need without compromising valuable floor or table space. When it comes to choosing the right sconce for your room, the style options are virtually endless. Whether you choose a decorative fixture to give your den or dining room a timeless appearance or you opt for a fixture that is more contemporary for your hallway or theater room, you’re sure to achieve the level of illumination that you desire. Semi-transparent frosted glass sconces are a common choice for homeowners who hope to accomplish general ambient lighting, whereas opaque fixtures are effective at creating more dramatic mood lighting in a room. By far, one of the biggest benefits of choosing sconce lighting for your home is their amazing versatility. Because they are so minimally intrusive and are available in such a wide variety of decorative fixtures, wall lights are a beautiful addition to any room. Gone are the days where sconces were relegated only to dining rooms and other formal settings. In today’s modern homes, you can find sconce lights in several rooms, from the bathroom to the living room. Incorporating a dimmer switch into your lighting design with sconces provides even more versatility when you can adjust the level of illumination in a space. Finding the right sconce lights for your bathroom, bedroom, dining room, or any other room is simple with assistance from Brighter Homes Lighting in Eugene. Browse our online catalog to discover the perfect fixtures for your home, or swing by and talk with our no-pressure lighting specialists for your lighting solution today. We look forward to speaking with you!